Oct. 13, 2016, 12:30 p.m.
By Ricardo Bilton @rbilton Oct. 13, 2016, 12:30 p.m. 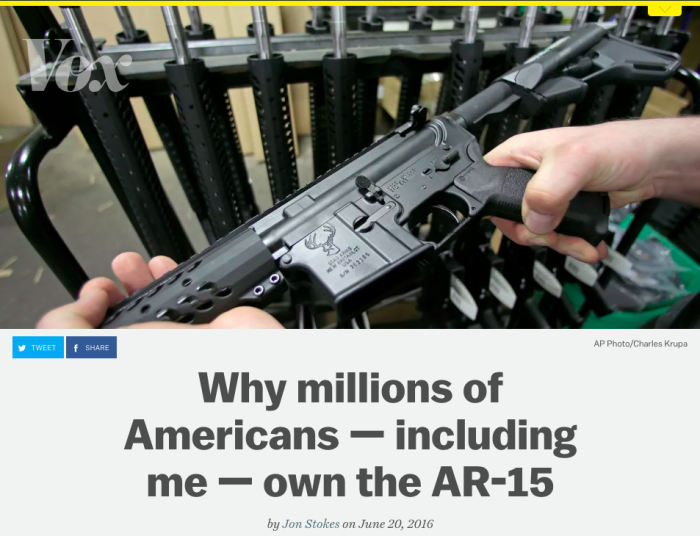 In June, Vox ran an article headlined “Why millions of Americans —including me — own the AR-15,” a 3,000-word case for the rifle best known for its role in mass shootings. In the article, Ars Technica founder and gun owner Jon Stokes argues that the AR-15, despite its negative reputation in the press, is the gun of choice for regular, sane people who need a weapon capable of adapting to a variety of jobs. The article, an adaptation of a post that Stokes wrote on Medium, felt like an odd fit for Vox, whose founders and editorial slant both tend towards the left. The many skeptical reactions to the AR-15 piece reflected that contrast, with many readers scratching their heads at Vox’s decision to run the post. @rgay The need to be contrarian and “evenhanded” about stuff like this is itself a key part of gun control inertia, I think. But for Vox, which has run many similar kinds of essays over the past year, the AR-15 piece had a goal: to offer a provocative, personal take on a story that everyone was talking about, but in a way that only someone like Stokes, who owned the gun, could offer. That’s a core part of the mission beyond Vox’s year-old First Person section, which is dedicated to publishing similar sorts of “compelling, provocative narrative essays.” Vox has published more than 200 of these personal essays since last year, letting writers share their personal experiences on big topics such as Brexit, voting for Donald Trump, and being the only woman at a startup. The idea for the First Person section came in mid-2014, when Vox ran an essay by Katie Morrison headlined “9 things I wish people understood about anxiety.” The story, which started as a short post that Morrison wrote on Tumblr, was a runaway hit on Vox, both on the initial day that it was published and in the days and weeks afterwards. The success of the story was significant enough that it encouraged Barkhorn to spend more time publishing personal essays, not only because these stories do well traffic-wise, but also because they fit within Vox’s mission to explain the news — only in a slightly different way from the explainers its best known for. “We have had reporters who are doing great work, interviewing people and covering big stories, but we didn’t have a regular place where we were hearing from people who are experiencing a lot of these news stories and news themes firsthand,” said Barkhorn. While Vox regularly covers big stories with a top-down, high-level perspective, first-person essays offer a more subjective, on-the-ground perspective on those same stories. Vox’s coverage about race and police shootings, for example, has been supplemented by an essay from Redditt Hudson, a black man who served on served on the St. Louis Police Department for five years. Vox has done this same for topics like men’s rights activism (“The internet is full of men who hate feminism. Here’s what they’re like in person“), safe spaces on college campuses (“I’m a black UChicago graduate. Safe spaces got me through college“) and even Zika (“I got Zika. The US health care system had no idea what to do with me“). While Vox initially experimented with first-person essays about relationships and parenting, it found over time that the first-person essays that did well on the site mirrored the other kinds of stories that resonated with Vox readers — stories focused on criminal justice, identity, politics, international issues, and mental health. “That conclusion feels obvious, but it wasn’t at first,” Barkhorn said. Vox has more recently expanded the scope of its First Person initiative with a series of “as told to” essays. The most ambitious of these was “Life After The Olympics,” a series of personal narratives focused on the lives of eight Olympians after they’ve come home after the games. Vox has also looked to its own archives for essays with themes that are evergreen enough that they’re worth republishing every few months and relevant news hits. Vox, for example, republished Hudson’s essay about being a black cop months later, when news events meant it was newly relevant to audiences. With First Person, Vox has become one of many publishers interested in collecting and publishing the personal perspectives of readers. BuzzFeed, Fusion, Jezebel, and The Guardian all run sections or regularly feature these kinds of stories, which tend to attracted audiences of hate readers and advocates in equal measure. The challenge for all these publishers, including Vox, is to publish stories are provocative in a way that informs, not just shocks, audiences. POSTED Oct. 13, 2016, 12:30 p.m.
Bilton, Ricardo. "With its “First Person” initiative, Vox is using personal essays to supplement its explainers." Nieman Journalism Lab. Nieman Foundation for Journalism at Harvard, 13 Oct. 2016. Web. 20 Apr. 2019. Bilton, Ricardo. "With its “First Person” initiative, Vox is using personal essays to supplement its explainers." Nieman Journalism Lab. Last modified October 13, 2016. Accessed April 20, 2019. https://www.niemanlab.org/2016/10/with-its-first-person-initiative-vox-is-using-personal-essays-to-supplement-its-explainers/.